If you look for a way to help your kid learn new things while keeping his attention while learning, the best way to do that is with the right educational game. These games exist for many different purposes so choosing the most fun and exciting one for your kid to enjoy and learn is hard. To make it easier for you, we did our research and we discovered an exciting singing and dancing kids’ educational game your kids will enjoy for sure while learning his favorite tunes. 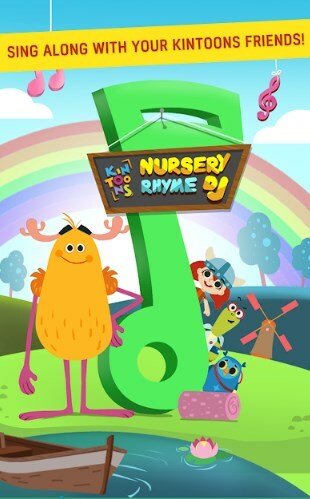 Meet Nursery Rhymes DJ – KinToons, developed for Android users as one very fun, exciting and easy to play kids singing game which helps the kids learn their favorite nursery songs while they enjoy dancing and singing, choosing any song they like the most to be played by any of the characters available. Adorable graphics and simple controls are offered and the users can choose any of the songs to be played in any order they like to. With this kid’s game the toddlers will enjoy learning their favorite tunes and with the features available their attention will be kept anytime they are playing on this educational game. Nursery Rhymes DJ – KinToons is based on phonics games in order to help each kid learn his favorite nursery rhyme songs in a unique way while learning in an interactive and immersive way, listening the songs played by adorable characters with funny expressions, set in the unique universe of singing and dancing. The vibrant voice-overs on the game will keep the kids interested and you can choose how to play the nursery songs, in which order and which character’s voice you want to sing the songs. For the kids, the game provides multiple educative environments, the first two for free and the others can be purchased. Every platform has its own elements and the elements can be interacted to give you happiness points. To see the magic, you need to fill the happiness bar. On this kids’ game, you can choose between 3 nursery rhyme songs in 4 different voices and between 4 loveable characters in enchanted backgrounds so the kid can fully enjoy the dancing and the singing while learning the nursery songs in the same time. Download the game for free on Google Play to let your kid have fun while learning nursery songs at the same time!